It’s no secret. IT managers and execs are a tightly wound bunch. Every day, they have to deal with a wide range of strategic projects, executive requests, and, of course, urgent fires that must be extinguished. And although PC Refreshes are incredibly important for keeping users productive while also delivering better security for the organization, these time-consuming projects never seem to make it to the top of the IT to-do list. 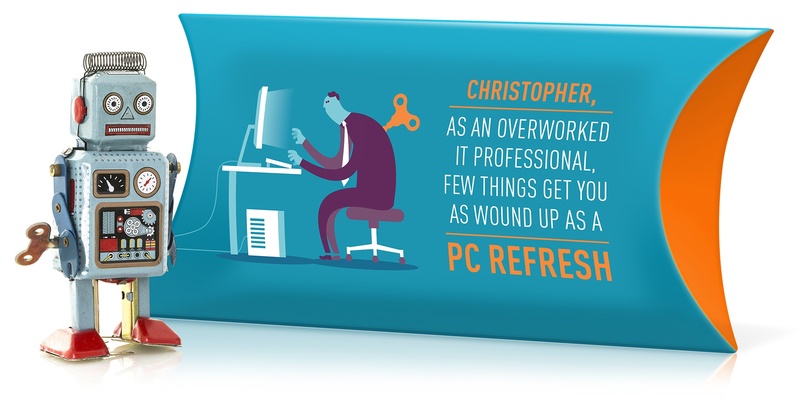 Softchoice wanted to let its valued customers know that they could help by taking this essential PC Refresh off the hands of busy IT teams. By “winding up” Softchoice, they could competently complete this strategic project while the customers could stay focused on more important tasks. So we created a compelling direct mailer to capture the attention of these busy professionals. Inside the box, we also included a fun gift to help extend the core concept of the campaign. 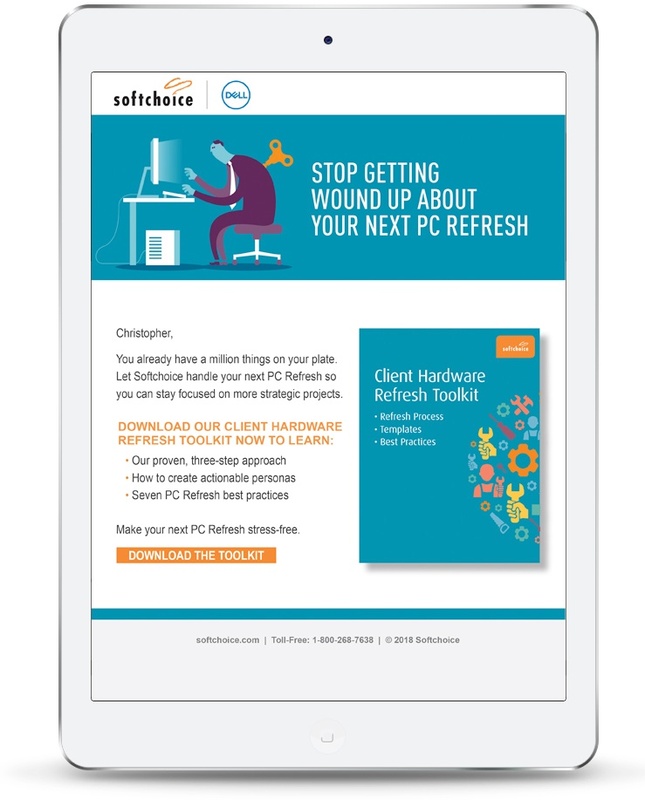 Targeted prospects were also sent a series of emails to help promote the key messages of the campaign, alert them about the gift coming their way, and also to highlight Softchoice’s industry-leading Client Refresh Toolkit. Each email was also designed to drive recipients to visit a personalized digital destination to get more information. 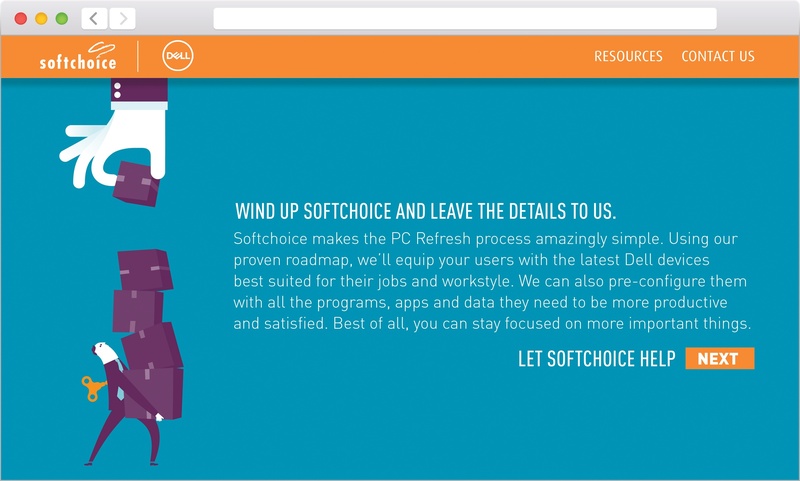 Once arriving at the site, recipients were given compelling reasons why Softchoice and Dell were the best choice for completing their next PC Refresh. In addition to the Toolkit, they could also download a Refresh Calculator, infographic and other info. If interested, recipients could also schedule a meeting with Softchoice to learn more. View the digital experience.